I know, this strawberry shortcake is completely adorable. Tonight I am off to the Park Avenue Armory for a performance, Astral Converted, by the Trisha Brown Dance Company. It's super nice to have a younger sister in the city who, as long as the price is right, is up for seeing almost anything. M. just got back from 2 weeks away so I'm guessing she's going to spend tonight not unpacking. Unpacking = not fun, packing = fun! We're both subscribe to the light packing philosophy, rarely checking bags, even on longer trips, so when I saw the One Bag site I got really excited to be an even more efficient packer. Yes, we're a bit dorky that way. Hope your weekend plans are whatever you want them to be. how was the strawberry shortcake and where was it from? Looks so good! Where is it from? 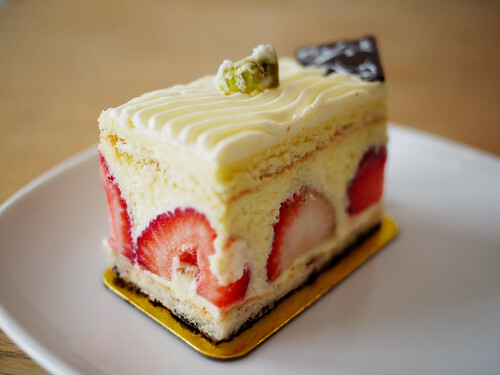 The always reliable Financier Patisserie!